Okay, so I've been a little bit lax in posting entries this year. Looking back, I made it through two entries before travel and other distractions broke my concentration. So even though we are mere hours from May Day, let's reset the clock and give 2013 a semi-official start. With that in mind, today's blog entry takes us back to New Year's Eve 2012. I had reservations to ride the New Year's Eve streetcar charter, an annual event hosted by the Friends of the Philadelphia Trolleys in the City of Brotherly Love. 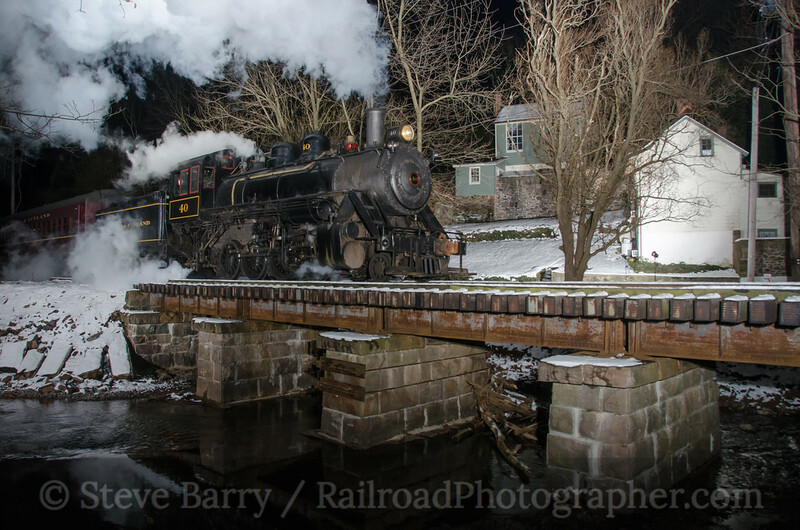 The trip begins at 10:00 p.m., and the new year is brought in while riding the rails. This was the first year I could make the event. Thus, during the afternoon of December 31, 2012, I headed south through New Jersey. I knew that New Jersey Transit's new dual mode locomotives were being used on the Gladstone Branch in the central part of the state. Being able to operate as a conventional diesel-electric or as an electric-only from overhead wires, the locomotives were purchased to run on lines where electrification catenary didn't reach the end of the route (for instance, trains from New York City run out of wires in Dover, even though the tracks -- and diesel service -- extend beyond to Hackettstown). The Gladstone Branch is electrified for its entire distance from Hoboken to its namesake town, and thus these dual-mode locomotives were not intended for Gladstone service. However, Hurricane Sandy put much of Hoboken under water, and even nearly four months later the damage to electrical substations at Hoboken kept the wires at the terminal de-energized. Thus, the dual modes were pressed into service, feeding off the wire from Gladstone to Broad Street Station in Newark, where the locomotives were switched to diesel to continue into Hoboken. On this New Year's Eve, cloudy skies were present, so I decided to go for a shot that is never properly lit when the sun is out. 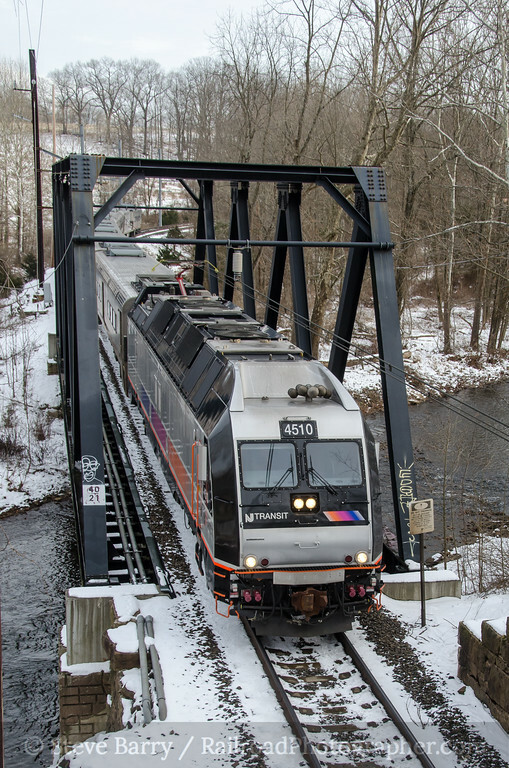 There's a through truss bridge over the South Branch of the Raritan River between the towns of Far Hills and Peapack, and westbound trains immediately enter a man-made tunnel under Route 512. I used the top of the portal for a perch to get the train running under wire. With that shot done, up next was a visit to the New Hope & Ivyland in Bucks County, Pennsylvania. Even though it was a week past Christmas, old St. Nick was still riding the rails on the incredibly popular Santa Claus Specials. I met Mike Burkhart at the small community of Hood, located just outside New Hope, and we plotted how we would light the train. While plotting, the homeowner who has the property on the west side of the deck girder bridge at Hood came out to check his mail. We got into a conversation with him, and he graciously let us use his property to get the train from an angle neither one of had gotten before. As darkness moved in, Santa and his train showed up and we were able to light the train and about half the houses at Hood. Mike went home to take his wife out for New Year's Eve, while I headed down to Philadelphia, meeting up with the organizers of the charter at the Callowhill streetcar and bus depot in the western part of the city. Kawasaki streetcar No. 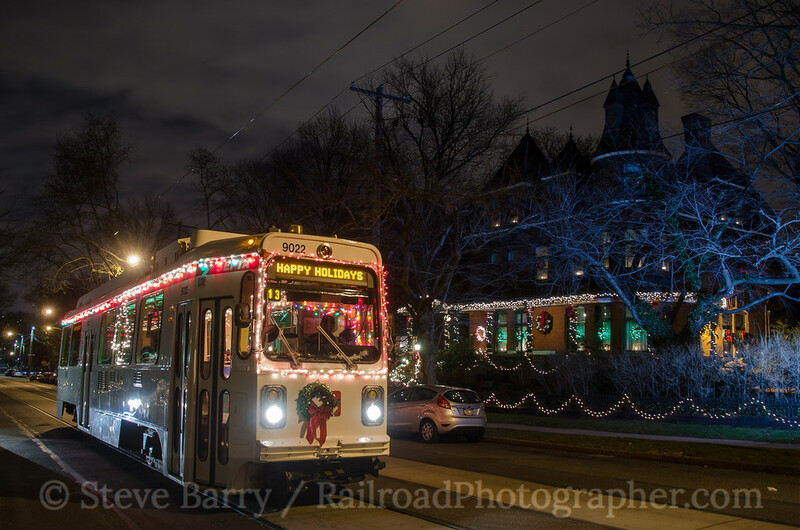 9022 had been decorated for Christmas by SEPTA streetcar operator Gary Mason, and it would be the car used for the charter (with Gary doing the honors as operator). Most of the patrons would be boarding at the loop at 63rd & Malvern Streets, so with a nearly empty streetcar I rode up from with Gary and photographed him just as he waited for traffic to clear so he could guide the car into the loop. With passengers on board, the streetcar headed for the Sugar House Casino at the east end of SEPTA's Route 15 on Girard Avenue. The plan was to shoot the streetcar with fireworks at midnight. Not coincidentally, Mike Burkhart and his wife had chosen the Sugar House as their New Year's date destination, and they came out to join us. 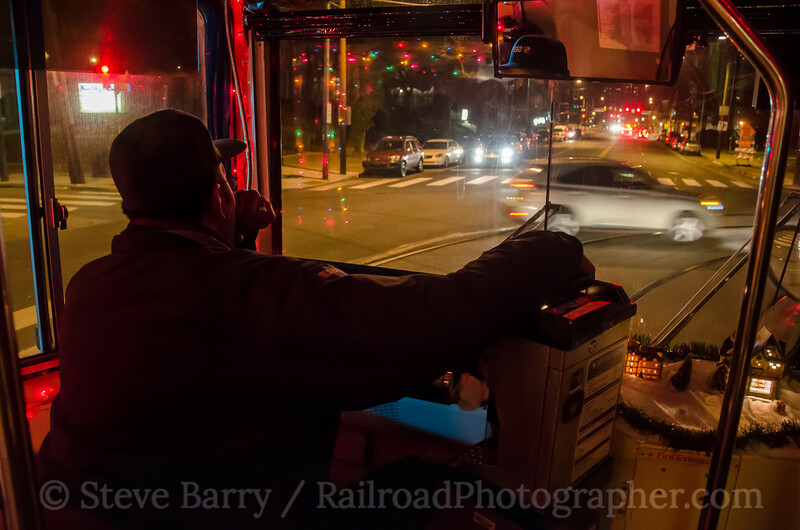 The fireworks didn't quite line up with the streetcar, but we brought in the new year right -- by photographing a trolley! Once the fireworks ended, Mike and Jen went back into the casino and we continued on our way. For the rest of the night we wandered the streets of Philadelphia, stopping occasionally for photos. One location, popular with charters, was in front of the Gables Bed & Breakfast, which is always well-decorated for the holidays. Soon we were back at Callowhill Depot sometime around our 2:00 a.m. scheduled arrival. It was a great New Year's Eve! And with that, I'll wish you a belated Happy New Year and raise a toast to more blog entries on a more regular basis as we continue through 2013!